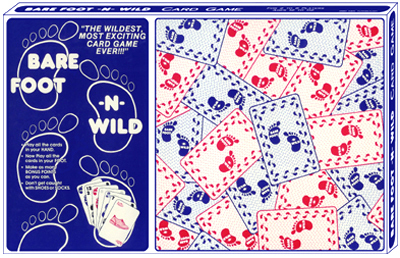 BARE-FOOT-N-WILD is a card game that has thrilled many people over the years. Those who have not played it though, will say that it is one of the newest, wildest, most exciting family card games ever created! Combining strategy with the luck of the draw, this fun family card game has been carefully designed to make playing the game fun and easy. In addition, exciting new terms that correspond with the specially designed cards create excitement as you learn how to play BARE FOOT-N-WILD. For those who like playing Canasta, BARE-FOOT-N-WILD has a similar feel. You will feel right at home as you explore the fun cards and terminology. An Exciting Family Card Game! The object of this card game is to be the player or the partnership with the highest score at the end of five rounds of play. Each round begins with a "BARE FOOT shuffle". This means everyone participates in the shuffle but no one deals! Each person picks their opponent's cards for them, which includes one group for your rival's "hand" and one group for their "foot". First, all the cards in your "hand" are played. Then you play all the cards in your "foot". Remember to make as many bonus points as you can. For those who like a challenge, BARE FOOT-N-WILD has got all the right components. Collect "Clothing Cards" and score lots of bonus points. Get caught with six or less and you'll see why we say "Don't get caught with Shoes or Socks!"